The 644. WE-Heraeus-Seminar “Bio-inspired, Nano- and Microstructured Surfaces: New Functionality by Material and Structure” takes place in Bad Honnef, Germany, on May 28-31, 2017. The Seminar will present a comprehensive overview about the current status of bio-inspired surfaces who’s functionality is caused by their nano- and microstructure or material. 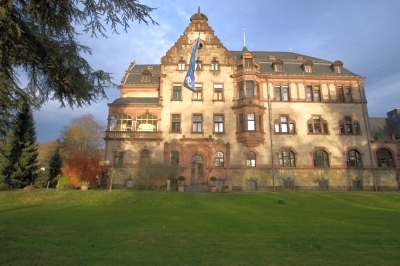 The seminar will take place at the Physikzentrum Bad Honnef , in the city of Bad Honnef, about 15 km south of Bonn. The Wilhelm and Else Heraeus Foundation is the generous sponsor of this seminar. The programme of the seminar starts early Monday morning (May 29, 2017) and ends Wednesday afternoon (May 31, 2017). Participants should plan for an arrival on Sunday evening and are invited to stay till Thursday morning. Please find the preliminary programme below. All participants are asked to present a their research in the field as a poster contribution. A few contributions will be considered as contributed short talks. All participants have to apply through the registration form which can be found on the web-page. Please send your registration and abstract directly to them well before the deadline on March 31, 2017, as the number of participants is limited. Applicants will be informed shortly after the deadline.